Here’s an interesting phenomenon – a Microgaming-developed slot game without any bonus games. That’s right - not one. No free spins, arcade bonuses, click me game, Pick ‘em bonus – nothing; not even an Expanding Wild to make things interesting. 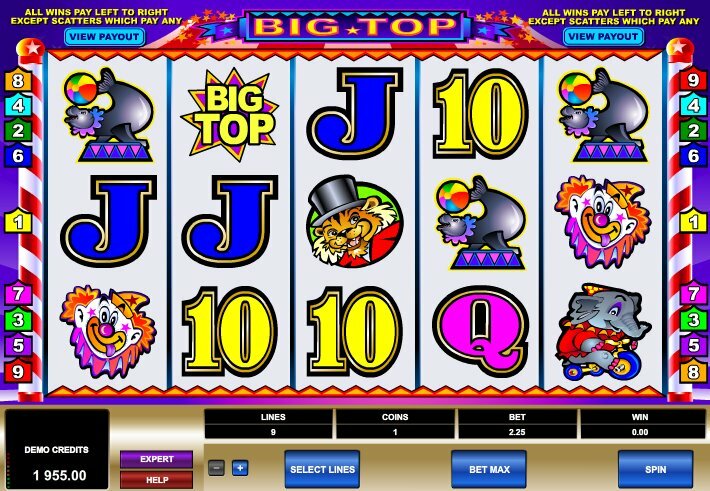 If there was an award for ‘entry level’ slots, however, it might go to Big Top, a 5 reel, 9 pay-line game from the leading developer that takes in the excitement of the circus and lays it out over the reels. Having said that, betting at $5 a coin is available, and with a top jackpot of $25,000 for landing five Big Top logos when playing at that level, there’s certainly something for the bigger bettors to enjoy here if they want fast, simple fun. As for symbols, there’s plenty of circus-friendly imagery in the game: cartoony lion ringmasters in hats, elephants, seals, and clowns are plastered all over the reels, plus the usual 10-through-Ace cards. The movement on the reels is pretty slick too, and it does have the feel of a classic land-based slot – minus the fruit, bells and whistles. The Clown symbol acts as the game’s Wild, substituting for all symbols other than the Scattered Monkey icon. Three or monkeys anywhere triggers a win (50x the line bet for five Monkeys) but in terms of bonus wins, the monkeys won’t trigger anything other than a neat little circus routine. 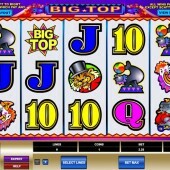 For gaming novices, Big Top does offer a little insight into the world of online video slots games, and with its simple, smiley graphics, it certainly will appeal to fans of basic slots. However, with betting possible at the top-heavy end there is a glimmer of hope for more serious player, although I would have wanted to see a bonus game or two. Even a basic free spins game isn’t out of the realm of possibility, surely? In terms of other circus-themed slots out there, make a beeline for OpenBet’s lavish Big Top Extravaganza, with its free spins and multipliers, or Microgaming’s own take on the freak show circus, the macabre Twisted Circus: there the graphics are more intense, the subject matter darker, and yes, the bonus rounds a lot tastier.